The Garth Brooks Tribute band is fronted by Adrian O Reilly and features top class musicians who perform live throughout the show. 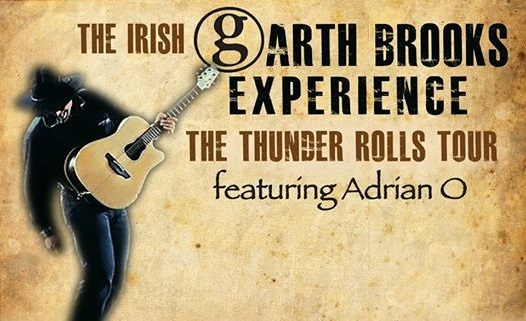 The Irish Garth Brooks Experience is a show that will highlight all Garth Brooks classics: ‘If Tomorrow Never Comes’, ‘Friends in Low Place’, ‘Baton Rouge’, ‘Shameless’, ‘The River’, ‘The Dance’ to name but a few and of course ‘The Thunder Rolls’, the name of our 2014 Garth Brooks Tribute band tour. With it’s unequaled sound it’s as close you can get to the real deal! The band has some well known members in the country scene in Ireland, Frank Downey on steel guitar, Barry Conboy on lead guitar, Brendan Reilly on acoustic guitar and backing vocals, Tommy Meehan on bass guitar and backing vocals, Padraic Harris on keyboards and Pierre Greijmans on drums. The American country rock feel by the musicians, accompanied with the vocalist Adrian O Reilly as Garth Brooks, gives this tribute to Garth Brooks a breath of fresh air! On the back of the success of Adrian’s solo tribute he started getting call’s for a live stage show. As with Adrian’s solo act he was cautious not to do anything half hearted and as a result of over a year’s preparation he now is happy to launch his 7 piece Fully live Garth Brooks tribute. The show will feature all the hits and boost’s a line up of some of Ireland’s top musicians including on guitar and also the show’s musical director Barry Conboy. The show will also feature state of the art Fohhn line array sound and professional lighting. So if it’s the REAL DEAL your after why not talk to us about our live Garth Brooks Tribute Band. Adrian has enjoyed success as a solo performer for over 20 years now and has always featured Garth as an intricate part of his show. Even through the decades when it appeared Garth was long forgotten Adrian always played a selection of songs from Garth as he felt they maintained the appeal even more so as others had long since stopped singing the songs. With booking’s now from Dublin to Donegal to Galway and as far south as Waterford Adrian is now enjoying the success his faith in the music deserves……..